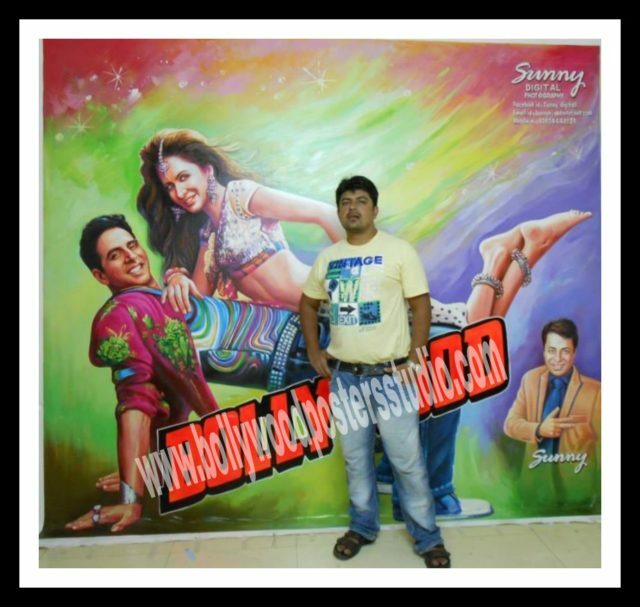 Are you looking for hand painted Hindi movie poster ? Contact us on mobile no. +919022034923 / +917666866256 or MAIL US ON: bollywoodpostersstudio@gmail.com Best hand painted Indian Hindi movie poster by the billboard poster painter and hoarding artists of Bollywood posters studio, Mumbai. The collection of best hand painted Hindi movie poster on sale !!! Grab the offer today. The lost art of hand painted Hindi movie poster made a come back with the last few remaining poster artists and billboard painters.These hand painted posters possess vibrant and loud colours along with the artists professional touch. Flaunt your visitors and relatives with the Hindi movie posters collection of Indian cinema. The priceless and authentic hand painted art on canvas beautifully by the hand painted Hindi movie poster artist of Bollywood posters studio Mumbai, India. Infact our legendary Indian Picasso in his early years earned a living by painting billboard for movies. This method flourished mainly in film industries of Mumbai and Chennai. The most of Indian movie posters on those days were design on oil canvas by the hand painted Indian Bollywood film poster artists. It attracts the viewers to the cinema hall. The hand painted posters of Indian Hindi movie itself narrates the entire story of the movie. The best hand painted posters and very rare collection of Dilip Kumar by the best hand painted posters old Hindi movie billboard artists of Mumbai, India at Bollywood posters studio. There are brilliantly creative handmade posters showcase in our website of commissioned Old Indian Hindi movie and customized Hindi movie posters. Get your art collection of commissioned hand painted Indian Hindi movie posters and custom Indian Hindi movie posters today !! !